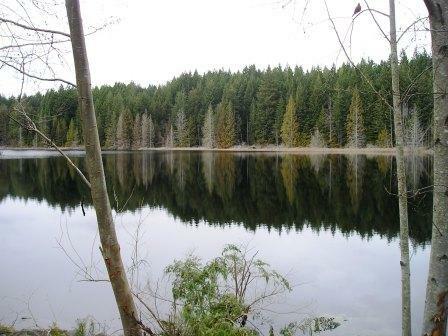 Trout Lake is a beautiful lake located in Halfmoon Bay and is a great destination for hot summer day. My favourite thing to do is combine a hike or bike with a dip in the lake. You can take your pick of a route, but here's the one I took the other day. 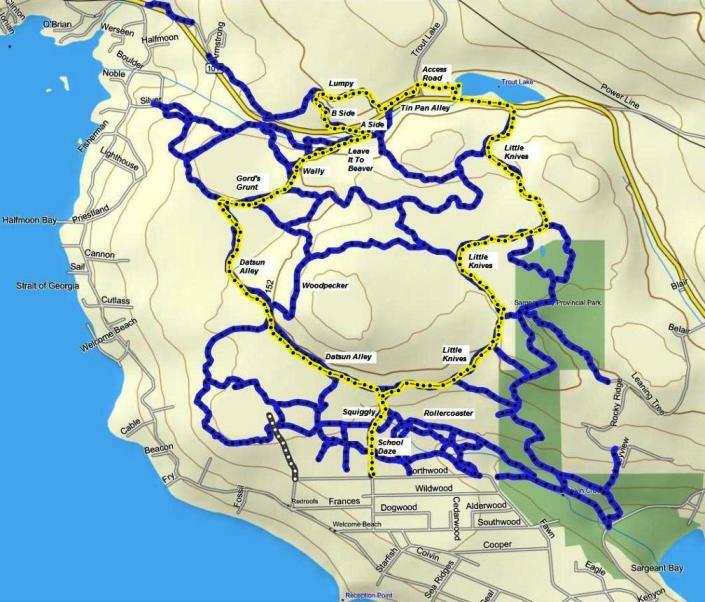 It's a nice combination of easy/intermediate level biking trails and includes a couple of the trails on the high side of the highway - the B side of Halfmoon Bay. This allows you to get to the lake and back to Halfmoon Bay Elementary School with only a short jaunt on the highway. Best access is via either Sargeant Bay or Halfmoon Bay Elementary School. My route starts at the school. If you want to start at Sargeant Bay, park and head straight up the trail. Take the third right all the way up to the pond and then follow my route from there. Take Hwy. 101 to Redrooffs Rd. If you are coming from Sechelt take the first, southeast entrance to Redrooffs. Coming from the Pender Harbour end of the coast, you will take the first entrance to Redrooffs that you come to. Follow Redrooffs to Southwood Rd. and turn right if you are coming from Sechelt or turn left if you are coming from the Pender end. Take the next left on Westwood Rd. and follow it to the end which is at Northwood Rd. You can drive into the Connor Park and park or you can go right on Northwood and park at the school if it isn't a school day. This route will likely take you between 2 to 4 hours depending on whether you are hiking or biking and whether you stop at the lake for awhile. The image below is interactive. It's a Google Earth gadget that embeds the image of the trail route. You can zoom in and out of it with the zoom bar on the right. You can also use the slider bar to move through the route. It's pretty cool. The route is marked in yellow. Click on the map below to view higher resolution pdf version. Enter the School Daze trail on the west side of the school (pretty much straight in from the entrance to the access road into Connor Park - right where the road makes a 90 degree turn towards the park). At the end of Squiggly you come out to Rollercoaster. Turn left and follow it along, over the bridge at the pond and keep left to get to Datsun Alley. Turn left on Datsun Alley and you're going to follow this trail all the way to its end (about a couple kilometres). Datsun Alley ends at Gord's Grunt. Turn right up Gord's Grunt. Follow it along and up the hill. You will pass two trails on your right (Woodpecker and Missing Link) keep left and the third trail you come to is Wally. Turn right onto Wally and follow it down to Leave It To Beaver. Turn right and follow Leave It to the next trail on your left. This will be A Side. Turn left onto A Side, over the bridge and up to the highway. Cross the highway and you'll see the entrance back into B Side. Take B Side to Lumpy and turn right. Follow Lumpy along. It turns into Tin Pan Alley. Stay on Tin Pan Alley out to Trout Lake Road. Turn left and then right onto the access road into Trout Lake. At the picnic table, you will see a trail that heads off to the right if you are looking at the lake. You can follow that trail out to the highway, turn left and follow the highway a few hundred metres to the bus stop sign on the right side of the highway. A trail enters into the forest right at the bus stop with Trout Lake on your left. You will be able to see it when you get close to it. Turn right into the trail. This is Little Knives and you are going to stay on this trail all the way back down to the junction of Rollercoaster and Little Knives/Datsun Alley. There are many trails that intersect Little Knives on the way. Don't take any of these trails unless you want to take a different route home (and make sure you know where they will take you). At this point you can just backtrack to where you parked your vehicle. Click here to return from Trout Lake to the Bikes & Hikes page. Click here to return from Trout Lake to the Home page.